For other uses, see Antaeus (disambiguation). Antaeus (/ænˈtiːəs/, Greek: Ἀνταῖος, Antaîos, lit. "Opponent”, derived from ἀντάω, antao - I face, I oppose, was a figure in Greek. In Greek sources, he was the half-giant son of Poseidon and Gaia. His wife was the goddess Tinge, and he had a daughter named Alceis or Barce. He was famed for his loss to Heracles as part of his 12 Labors. In the interior desert of Libya. Antaeus would challenge all passers-by to wrestling matches and remained invincible as long as he remained in contact with his mother, the earth. As Greek wrestling, like its modern equivalent, typically attempted to force opponents to the ground, he always won, killing his opponents. He built a temple to his father using their skulls. Antaeus fought Heracles as he was on his way to the Garden of Hesperides as his 11th Labor. 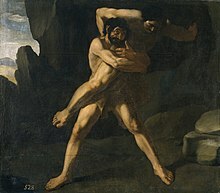 Heracles realized that he could not beat Antaeus by throwing or pinning him. Instead, he held him aloft and then crushed him to death in a bear hug. The contest between Heracles and Antaeus was a favored subject in ancient and Renaissance sculpture. Greeks of the 6th century BC, who had established colonies along the coast of North Africa, placed Antaeus in the interior desert of Libya. A location for Antaeus somewhere beyond the Berber world might be quite flexible in longitude: when the Roman commander Quintus Sertorius crossed from Hispania to North Africa, he was told by the residents of Tingis (Tangier), far to the west of Libya, that the gigantic remains of Antaeus would be found within a certain tumulus; digging it open, his men found giant bones; closing the site, Sertorius made propitiatory offerings and "helped to magnify the tomb's reputation". In Book IV of Marcus Annaeus Lucanus' epic poem Pharsalia (c. AD 65-61), the story of Heracles' victory over Antaeus is told to the Roman Curio by an unnamed Libyan citizen. The learned client king Juba II of Numidia (died 23 BC), husband of the daughter of Antony and Cleopatra, claimed his descent from a liaison of Heracles with Tinga, the consort of Antaeus. In his Life of Sertorius cited above, Plutarch recounts what he says to be a local myth, according to which Heracles consorted with Tinge after the death of Antaeus and had by her a son Sophax, who named a city in North Africa Tingis after his mother. Sophax in his turn was father of Diodorus who conquered many Libyan peoples with his army of Olbians and Mycenaeans brought to Libya by Heracles. Moreover, some related that Heracles had a son Palaemon by Iphinoe, the daughter of Antaeus and (presumably) Tinge. Scholiasts on Pindar's Pythian Ode 9 also recorded a story which made Antaeus king of the city Irassa in Libya, and father of a daughter named either Alceis or Barce. Antaeus promised her hand to the winner of a race, just like Danaus did to find new husbands for his daughters. Alexidamus beat all the other suitors in the race and married the daughter of Antaeus. Three versions of this story, with minor variations, were collected by the scholiasts; one of those versions made Antaeus, king of Irassa, a figure distinct from the Antaeus killed by Heracles, while another one suggested that they were one and the same. ^ Pseudo-Apollodorus, Bibliotheke ii. 5. ^ Kleiner, Fred S. (1 February 2008). Gardner's Art Through the Ages: V. 2: A Global History. Cengage Learning EMEA. p. 550. ISBN 0495410608. ^ I. Malkin, Myth and Territory in the Spartan Mediterranean, 1994:181-87, giving sources, noted in Robin Lane Fox, Travelling Heroes in the Epic Age of Homer, 2008:182 and note 51. ^ Pliny, Natural History, 5. 2–3; Strabo 17. 3. 8 noted in D.W. Roller, The World of Juba II and Kleopatra Selene, 2003:54 and 154, and by Fox 2008:182. Baynes, T.S., ed. (1878). "Antæus" . Encyclopædia Britannica. 2 (9th ed.). New York: Charles Scribner's Sons. p. 100. "Antaeus" . Encyclopædia Britannica. 2 (11th ed.). 1911. p. 88. "Antæus" . The New Student's Reference Work . 1914. "Antaeus". Dictionary of Greek and Roman Biography and Mythology. 1. 1870. Apollodorus, Apollodorus, The Library, with an English Translation by Sir James George Frazer, F.B.A., F.R.S. in 2 Volumes. Cambridge, Massachusetts, Harvard University Press; London, William Heinemann Ltd. 1921.